A brief word of explanation about these biographical sketches. These will mostly be about the things I found out about these men for which there wasn’t room in Convoy. They do all feature in the poems but there is so much more to tell about their lives. Each one of them could do with a book to himself and many of them, for example Laddie Lucas and Tom Neil have written their own books. Captain Thomas Horn is someone who I really wish had written a book about his experiences during the war. He was master of the Blue Star line’s Sydney Star. He was born in Amble, Northumberland in May 1899. He went to sea when he was fifteen and he obtained his second mates certificate in 1924 and his Master’s certificate in 1924, the year he got married. He took the Sydney Star on her maiden voyage to Australia in May 1936. London Gazette 16 December 1941 - For services when the ship was torpedoed and damaged during Operation Substance - a convoy from Gibraltar to Malta in July 1941. The following morning the ship is bombed by a Ju88 without any consequences although this does raise the spirits and interests of the pilots. “The Captain and several of his officers having joined us for the meal, it was obvious that the headman was in a nervous and unsociable mood – as well he might be! Much less concerned we joked about the attack, pointing out that the bombing had been as effective as the gunfire, which seemed to us all bark and no bite The gunners were hopeless, we opined. How could they expect to hit anything if they were ignorant of even the rudiments of deflection shooting? Being fighter pilots we knew all about such things, naturally; it was a pity the gun crews weren’t similarly competent. We laid it on pretty thick, aware of our hosts’ frowning and slightly injured silence. Finally the Captain stood up and blotted his lips. Did we think we could do any better? We all exchanged exaggerated glances of surprise. Of course we could; it was just a matter of know-how and practice wasn’t it? He nodded then turned away. In that case when the next attack came, we could show him just how it was done. All right? They and the ship survive the attack and continue on their voyage. 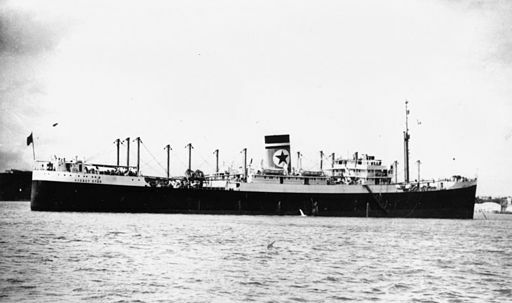 The Sydney Star reached Egypt on Tuesday 30 December 1941. I can't wait for the book - this is all really fascinating. I must admit that I'm envious of all the documentation you've been able to find. Almost all of my subject lies outside living menory and some of it is even pre-census. It must have been very time consuming but totally engrossing too. I'm full of admiration for the way you took one poem and turned it into a full collection. You have definitely taken on a challenge with the Slate islands. I do still have some gaps and frustrations despite all I've been able to find out about the Malta convoys. One of these is that I've not managed to locate a photograph of Thomas Horn. I would love to know what he looked like. Mavis, I am the grandson of Thomas Sydney Horn, and if you wish any photos or further details, then please just let me know. I will get in touch as it would be lovely to hear more about him.